Just one professional teeth cleaning can cost hundreds of dollars! PLAQUE ATTACK will only cost you pennies a day! Healthy Prevention 4 out of 5 dogs will get gum disease in their lifetime! Gum disease can lead to more severe infections in the heart, kidney, and liver of your beloved pet. 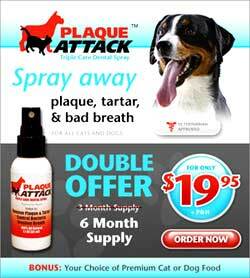 Spray in your pet’s mouth and PLAQUE ATTACK’s all natural formula quickly and safely mixes with saliva to coat the teeth and gums. The ingredients then do all the work to break up bacteria, plaque, and built-up tartar. Application helps eliminate these causes of bad breath, leaving your pet’s mouth healthy and clean. Best of all, it’s just that easy to use!